It is located in Jalan Kolonel Masturi No.325, Cihanjuang Rahayu, Parongpong, Kertawangi, Cisarua, Kabupaten Bandung Barat, Jawa Barat 40551, Indonesia . IF you want to see a waterfall with clear water color, then in Curug Cimahi you can see a colorful waterfall like a rainbow. 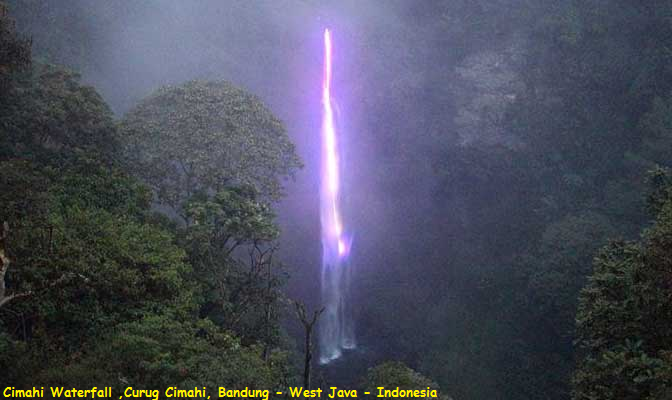 Because of the colors that are presented here in Curug Cimahi is called the Rainbow Waterfall. Well if you are interested to see the colors of waterfalls you can come to Curug Cimahi on Jalan Colonel Masturi No.325, Cisarua, West Bandung regency. Curug Cimahi which also called rainbow waterfall (The Rainbow Waterfall) indeed presents a range of colorful rainbow. But interestingly, this Cimahi waterfall does not bring rainbow in the morning, afternoon or afternoon like most of what happens in other places. But the Rainbow in Curug Cimahi is present from evening. Rainbow in Curug Cimahi this is not the rainbow as usual that we witness. But this rainbow in Cimahi waterfall is a rainbow that emerged from the lights of colorful LED lights that have been installed by the manager of the waterfall.